In a series of educated and insightful articles, the New York Times Editorial Board reviewed the current state of cannabis in American culture, exploring the social costs, health ramifications, and history of injustice as a result of prohibition. The six part series begins with states' rights, then moves on to a revealing look at how cannabis prohibition and its lopsided enforcement has hit people of color the hardest. Studies have found that blacks and whites use cannabis in roughly equal amounts, but in all states but Hawaii, blacks are far more likely to be arrested. In some states (such as Iowa), blacks are up to 8 times more likely to be arrested. The series of articles continues to cover the history of marijuana prohibition from its roots in the 1930s to present day legalization "experiments" undertaken by Colorado and Washington. It then reviews the health effects discovered around cannabis use in comparison to those who have used tobacco, cocaine, heroin, and alcohol. 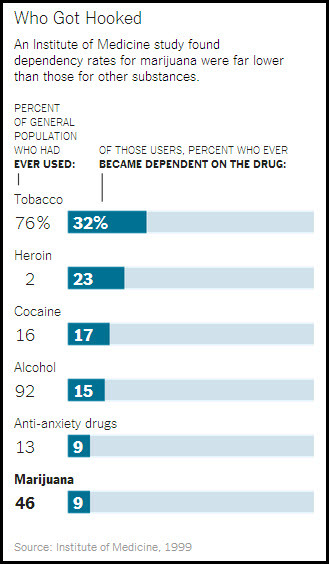 Here's a revealing graphic around use and abuse of these substances. The series also includes a review of how cannabis can be decriminalized and regulated to the benefit of state and local governments, as well as the communities they serve. Pending legalization, they also suggest controls over the marketing of cannabis products that should emulate the tobacco industry's restrictions on targeting young people, banning outdoor advertising and product placements. It's an amazing and encouraging thing to see such a reputable media outlet coming out in support of widespread legalization, taxation, and regulation of cannabis. We highly recommend this series of articles to anyone involved with the industry or curious about its changing legal status. Read it here.